O4 - HKLM\..\Run: [UpdateLBPShortCut] "C:\Program Files (x86)\CyberLink\LabelPrint\MUITransfer\MUIStartMenu.exe" "C:\Program Files (x86)\CyberLink\LabelPrint" UpdateWithCreateOnce "Software\CyberLink\LabelPrint\2.5"
O4 - HKLM\..\Run: [UpdateP2GoShortCut] "C:\Program Files (x86)\CyberLink\Power2Go\MUITransfer\MUIStartMenu.exe" "C:\Program Files (x86)\CyberLink\Power2Go" UpdateWithCreateOnce "SOFTWARE\CyberLink\Power2Go\6.0"
O4 - HKLM\..\Run: [Boingo Wi-Fi] "C:\Program Files (x86)\Boingo\Boingo Wi-Fi\Boingo.lnk"
Are you having any trouble with Microsoft Updates at all? Once the program is done, copy the contents of the notepad file into your next reply. WVCheck could not read the Auto-Update Option. Last success time for Automatic Updates for 'Detect', 'Download' and 'Install' could not be found. WVCheck found no known bad directories. WVCheck found no missing Windows files. WVCheck found no bad lines in the hosts file. User profile cannot be loaded. I try to browse on net how to resolve it and it lead me to use this help2go. I hope you can you help me on this? That is an indication that your Administrator acct. is corrupt. Lets see if we can fix that. To do so, we'll need to activate the hidden Administrators acct. The steps that I am about to suggest involve modifying the registry. 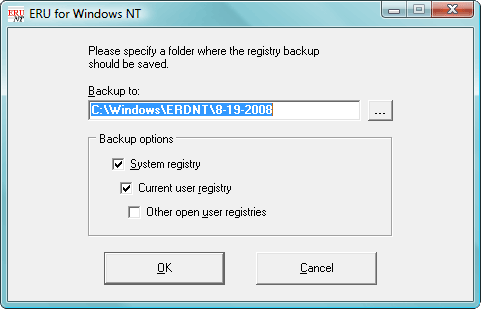 Modifying the registry can be dangerous so we will make a backup of the registry first. Modification of the registry can be EXTREMELY dangerous if you do not know exactly what you are doing so follow the steps that are listed below EXACTLY. If you cannot perform some of these steps or if you have ANY questions please ask BEFORE proceeding. (the default location is C:\WINDOWS\ERDNT which is acceptable). Press YES to create the folder. If you have any questions or concerns, do not hesitate to ask before proceeding. That is great news! Could you share with us how you fixed it? I'm quite sure it could help others with the same problem. If there is another administrator account that you can log into, then jump to step 7 after logging into that account. However, if you can't get to any accounts at all, then start at step 1. 5. Boot up again pressing F8, but this time choose just Safe Mode. 14. Eventually, you have switched the .BAK from the end of the second entry to the first. That should probably fix your problem. 16. If you find another Application Data below the one you're on, then delete it. That should probably also fix your problem. 18. Wait until all Windows Files finish loading, then hitNext when it asks keyboard language. 20. If that still doesn't work, then if you have your Windows Installation CD still, put it in and restart your computer. 22. Choose keyboard language then hit next. Find Repair Your Computer from a little below the center left. Wonderful! Thank you for sharing. The instructions you followed are the same as I linked you to above. And you are most welcome for what little I did. Let us know if you have difficulties accessing MS Updates now. It is to your best interest to get your Win7 to update to Service Pack 1 and IE9. Anytime you go tinkering in the registry, it is a good idea to back up the registry beforehand. Have a nice day cenon!